Kowloon Hong Kong is the city’s slightly grittier side. The Kowloon Peninsula is often - and only half jokingly - referred to as the ‘dark side’ by residents on Hong Kong Island. In our tourist guide we walk through the temples, the markets and some of the other must see sights. Kowloon Hong Kong was long the overlooked ugly sister to Hong Kong Island’s Cinderella. Sat north of Hong Kong Island - where Central, the skyscrapers and the famous skyline are found – Kowloon is bordered by Victoria Harbour to the south and the New Territories in the north. In Mongkok and Temple, Kowloon is home to some of the most densely populated neighbourhoods not only in Hong Kong but on the planet. They are also some of the city's most interesting districts. This is very much working class Hong Kong, and its streets bulge with hawkers, markets and the best Cantonese food in the world. Kowloon is also home to most of the city's museums and mid-range hotels. The prices at Kowloon hotels tend to be cheaper than across the water, and many are concentrated in Tsim Sha Tsui. Most tourists will start off in Tsim Sha Tsui. This is the sharp end of the peninsula that faces Hong Kong Island, where the Star Ferry connects and, a key tourist district. Ir's also home to most of Hong Kong's biggest museums. Along the waterfront you’ll find both the landmark Hong Kong Museum of Art and the Museum of History. This is also the best place to get a glimpse of that famous Hong Kong skyline, with the Avenue of Stars and the newly crowned tallest skyscraper in town, ICC all offering top notch views. Also worth a mention on the waterfront is the Peninsula Hotel. This grand old dame of the Hong Kong hotel scene has retained its century old colonial airs and graces and its afternoon tea remains a destination event. Inland, Nathan Road is the area’s main drag. Once known as the Golden Mile for its sparkling neon signs, the shops remain the bargains don’t. This is tourist trap haven; with knock off watches and suits being the two most popular scams and con artists always refining new ways to trick tourists into parting with their money. While you should skip the shops, there are a couple of stops worth making on Nathan Road, including Hong Kong’s haven of multiculturality at Chungking Mansions. Packed with immigrants and superb Indian and Pakistani restaurants, this is Hong Kong at its most vibrant. Across the road you'll find Kowloon Park, which is home to outdoor pools, a group of playful flamingos and the Kowloon Mosque. Unfortunately, beyond Chungking Mansions Tsim Sha Tsui is not an area associated with good value food. Skip the tourist trap Chinese restaurants and overpriced steak houses and head for Yau Ma Tei and Mongkok. These are some of the busiest streets in Hong Kong and packed with street side restaurants known as dai pai dongs. These basic al fresco canteens serve no frills noodle and rice dishes that are as good as the priciest restaurant in town. 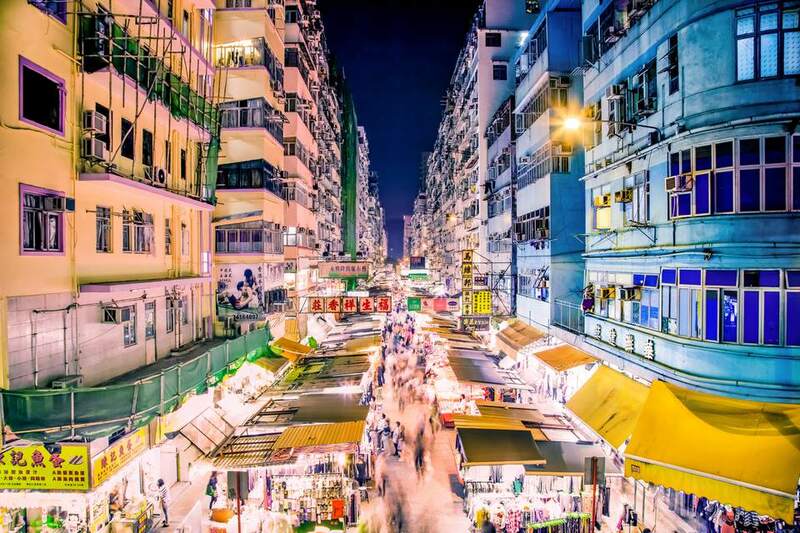 This is also the area to find Hong Kongs best markets. Our favourite is the Temple Street Night Market. Kicking off at around 8pm the selection of products on sale is as broad as in your local mall and still a good bit cheaper. Beyond the market stalls you'll also find showbiz fortune tellers reading palms, heads and other body parts, as well as traditional Cantonese opera singers giving impromptu concerts. Elsewhere, the famous Ladies Market in Mongkok is set up on a similar theme selling handbags, shoes and clothes, but also a healthy helping of tourist tat. More interesting is the Goldfish Market, which is a giant outdoor pet store, and the Bird Market, where feathered friends are for sale. Wider Kowloon also offers rewards, with the Sik Sik Yuen Wong Tai Sin Temple one of Hong Kong’s most popular places of worship and an excellent place to get introduced to the color, noise and energy that surrounds traditional Chinese festivals. Food fans shouldn’t miss Lei Yue Mun, which is a former fishing village now turned into a seafood destination. Live catch is still hauled up on the seafront and restaurants will cook whatever you pick out of the fisherman’s net.